Wow, this looks like it’s harder to make than than the street legal kart. As any budding young astronaut will tell you, his most important piece of equipment is a realistic helmet with light, radio, oxygen tanks, and plenty of colorful armor. WETHER they’re solving re-entry problems on the living room banister or stalking Martians in the orchard, junior spacemen need plenty of imagination-inspiring equipment. 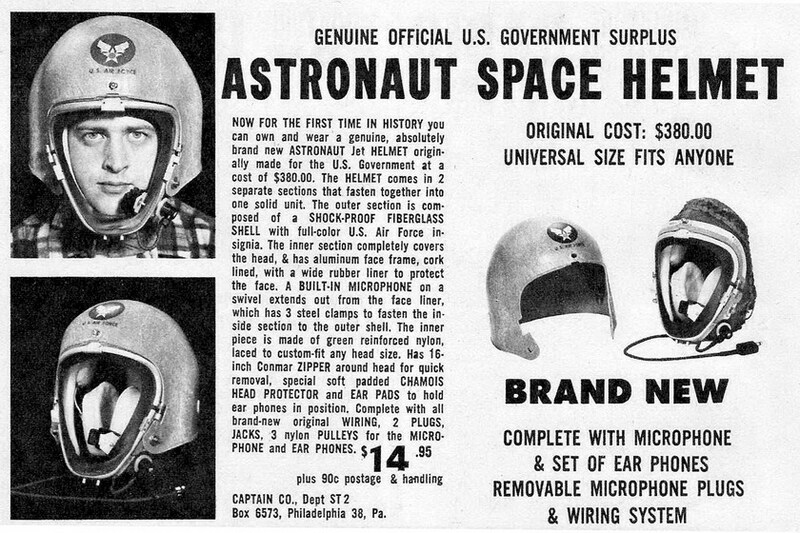 So vital a piece as the helmet should be built at home where the astronaut can help and be sure the construction meets space-age requirements. 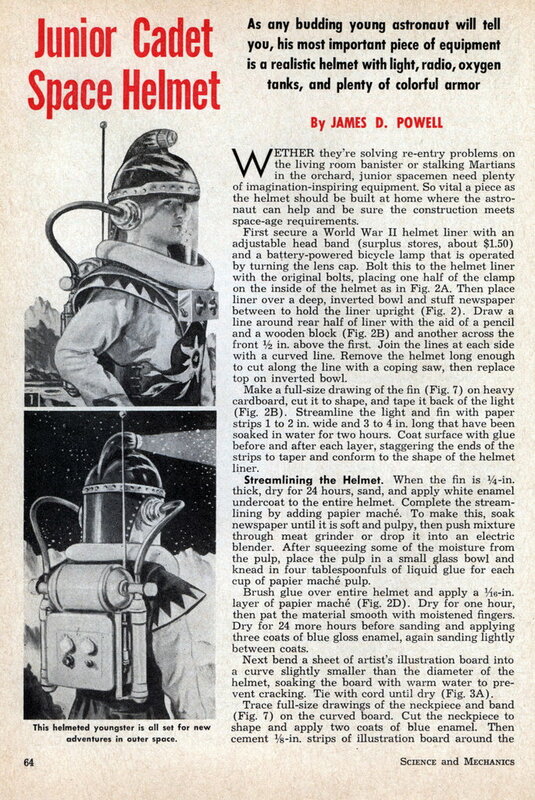 First secure a World War II helmet liner with an adjustable head band (surplus stores, about $1.50) and a battery-powered bicycle lamp that is operated by turning the lens cap. Bolt this to the helmet liner with the original bolts, placing one half of the clamp on the inside of the helmet as in Fig. 2A. Then place liner over a deep, inverted bowl and stuff newspaper between to hold the liner upright (Fig. 2). Draw a line around rear half of liner with the aid of a pencil and a wooden block (Fig. 2B) and another across the front 1/2 in. above the first. Join the lines at each side with a curved line. Remove the helmet long enough to cut along the line with a coping saw, then replace top on inverted bowl. Make a full-size drawing of the fin (Fig. 7) on heavy cardboard, cut it to shape, and tape it back of the light (Fig. 2B). Streamline the light and fin with paper strips 1 to 2 in. wide and 3 to 4 in. long that have been soaked in water for two hours. Coat surface with glue before and after each layer, staggering the ends of the strips to taper and conform to the shape of the helmet liner. Streamlining the Helmet. When the fin is 1/4-in. thick, dry for 24 hours, sand, and apply white enamel undercoat to the entire helmet. Complete the streamlining by adding papier mache. To make this, soak newspaper until it is soft and pulpy, then push mixture through meat grinder or drop it into an electric blender. After squeezing some of the moisture from the pulp, place the pulp in a small glass bowl and knead in four tablespoonfuls of liquid glue for each cup of papier mache pulp. Brush glue over entire helmet and apply a Vie-in. layer of papier mache (Fig. 2D). Dry for one hour, then pat the material smooth with moistened fingers. Dry for 24 more hours before sanding and applying three coats of blue gloss enamel, again sanding lightly between coats. Next bend a sheet of artist’s illustration board into a curve slightly smaller than the diameter of the helmet, soaking the board with warm water to prevent cracking. Tie with cord until dry (Fig. 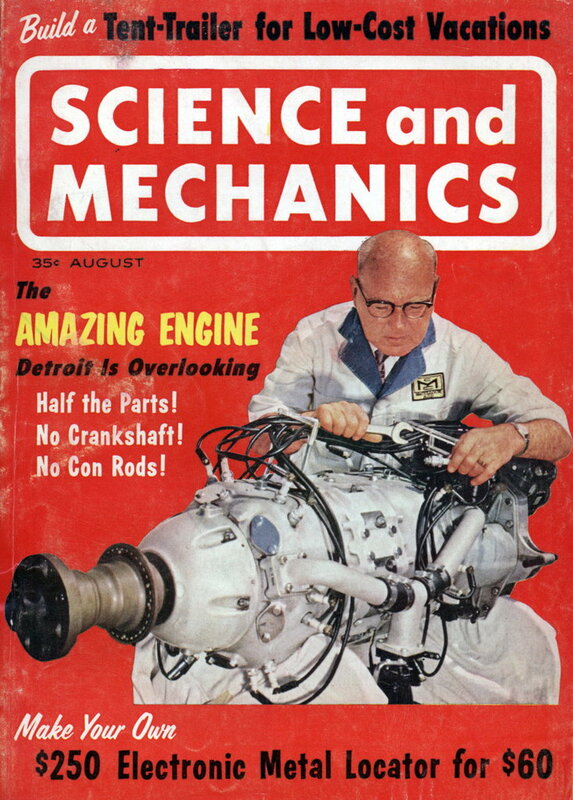 3A). Trace full-size drawings of the neckpiece and band (Fig. 7) on the curved board. Cut the neckpiece to shape and apply two coats of blue enamel. Then cement 1/8-in. strips of illustration board around the helmet as in Fig. 3B to permit the facepiece to fit against the sloping helmet, yet drop vertically to the shoulder. Clear Plastic Facepiece. Use 0.010–in. thick acetate sheet, available from local art supply stores, for the facepiece. Wrap it around the helmet (Fig. 3C) and trim to length, allowing 1/2-in. overlap in back. Tape ends together and use a china marking pencil to draw a line on the acetate along the top edge of the spacer strip. Cut along the line, then tape face-piece in place, matching top edges of the acetate and spacer strips. Ground your astronaut long enough to try on the helmet and cut the neckpiece to fit at the shoulder line as in Fig. 3D. Check and trim as needed until the helmet fits snuggly over the shoulders, chest, and back with full weight borne by band inside helmet. Now remove facepiece and decorate helmet with household aluminum foil. This wouldn’t have inspired me as a 9-year-old boy in 1962. It looks dated, like something out of the Buck Rogers 1930s, not the Space Age 1960s. As a kid, I had the Col. McCauley helmet from the 1960 T.V. series “Men in Space” (based on the Murray Leinster sci-fi novel) which was more realistic and based on the Air Force’s real X-15 pilot’s pressure-suit helmet. It included a “microphone” and a tinted visor. The helmet is now a sought-after collectible plastic toy. Sorry to dash your childhood memories but it wasn’t based on the pressure helmet that the X-15 pilots wore but rather the MA-2 helmet.